Hey folks, I'm going to show y'all how to make a leather watch band with some good ol' rock star styling, and how to make leather bracelets. We'll also touch on basic leather crafting techniques. 3-4 ounce veg tanned leather. Can be purchased in a convenient small project piece. I'll add several other bracelet designs ASAP, and I'll cover further tools with there steps. For the watch, I'm using one I got from Stauer. To attach to the wristband easily, it needs a T shaped attachment, as highlighted in the second picture. Firstt order of business for both watch band and bracelets is determining the size. 1 1/2 inches seems fairly standard for watch faces, and is just about the right width for leather 'n rockstar goodness. For length, first wear your watch and band, note where it buckles / attaches, is this a good spot for snaps? Reckon out a good design on paper. Cut a strip of paper 10 1/2 inches long (I think you should be able to find that nearby) and 1 1/2 inches wide (or whatever width you want your band to be). Use it to determine a comfy fit for your band, mark and measure. Add 1 inch to this measurement for a perfect fit, or 1 1/2 to adjust upwards. Using your knife and ruler, cut a strip of the appropriate width and length. Lay out your snaps, rivets, and watch hardware. Determine where you want it located. Wet the extra leather slightly. You need two small mini straps to mount the watch. Use your chopstick/scribe to trace the design onto the wet leather. Cut out with scissors and razor knife. A leather punch is helpful. Check the fit and adjust as necessary by shaving away leather. This is called skiving. Once you like the fit, punch a hole for a rivet. Wet the mini-straps and shape around the watch hardware. Wet leather can be molded, and once dried retains it's shape. The photos below explain it much better then I do. Once the mini straps are dry, lay it and the watch on your band, pick a happy spot, and punch ONE hole for the rivet that connect the band to the mini strap and watch. Slide a rivet post in to retain its position. Now put on the watch/band assembly. Mark where the other rivet needs to be, due to the asymmetrical nature of one's wrist, it will not allow the watch to lie flat on the wrist band. Punch this hole, slide a rivet post in, and double check the fit. Now's time to lay out the snaps. I'm going to use two side - by - side, evenly spaced. I also want to be able to adjust larger in case by some miracle my wrist gets thicker. For the snaps that will be on the outside, I'll use the female end, due to the larger size. Male posts, four of them to the inside. Remember we added an inch or two inches to your wrist measurement? This is to allow for the hardware. The center of the hole, and likewise the snap hardware, needs to be half an inch in from the edge, and for the "adjuster snap", one and a half from the edge. Mark and punch these holes. Dry fit the hardware. If you have a battery powered watch (not recommended), or one like mine with a fancy viewing window on the back, mark and cut a hole. I used a leather punch and razor to cut it out. If all's well, time for some decorative tooling. If all's not right, correct it, and punch new holes. If you have a boring personality and you want to leave it plain, skip ahead to the dyeing step. The basic concept of tooling and stamping is wetting the leather then making impression on it with a tool / stamp and a mallet. We'll begin by "caseing" the leather. We don't want it soaked, just dampened. A wrung out sponge or paper towel works well. I'm going to use a pear shader to give a "irregular dimpled" surface. Set your tool / stamp onto the surface of the leather, hold square with the work surface and strike firmly. Don't let your tool slip or bounce around, but don.t death grip it either. If you have it, goof around on a spare piece of leather first. There's a virtually infinite number of designs that can be tooled on leather. Feel free to go free form and experiment. For this project I didn't want to detract from the beauty of the watch and hardware, but I didn't want it plain either. Random dimples is a good, attractive spade taker upper. I just randomly hit it all over, then tooled on the edge of the leather. Once you finish, position strap in a around-wrist shape so that it will take that shape naturally in the future. Protect your work surface. Shake up your bottle, AFTER confirming the integrity of your bottle's cap. Dip a paper towel, or clean rag into the stain, you only need a spot. Apply to a scrap piece of leather. MAKE SURE IT'S WHAT YOU WANT!! Water based dye takes a moment to set in, but that doesn't mean slap it on and leave it. In a fluid, circular motion (due to the small size of this project just make horizontal strokes, I recommend circular on bigger items such as wallets purses etc..) apply the dye to the item, then wipe it off with a clean rag/paper towel from where you began. Wipe on, wipe off. Repeat. Continue until it reaches the color you want. Let it set for about 3 minutes at room temperature. Then buff with a clean paper towel. If it's too light, you can apply more, if too dark, to bad. I highly recommend applying Neatsfoot Oil, it helps seal and protect the leather. It darkens leather slightly, you can forgo dying in favor of an oil finish. After 24 hours, the leather can be sealed with boot polish. Dab some onto a clean cloth and have fun buffing. Moar buff, moar shine. This should be done monthly to keep the leather in good condition. Now for assembly. Track down all that hardware you laid out earlier. Triple check the positioning. Using the tools intended for the hardware, have at it. As with tooling, square, even, firm blows are optimum. A firm surface for setting is a good idea too. Firm means floor, not kitchen table. I got the multi tool set that has one anvil for all the rivet and snap sizes. Very handy, if you plan on doing any more of this type of stuff, I highly recommend obtaining it. Technically, the watch is complete but DONT TOUCH THAT REMOTE!! Next up is leather bracelets + further means of tooling and decorating leather. Leather carving is the next step up in standard leather tooling. The principal is you cut into the surface of the leather (not all the way through), then use tools called "shaders" to make impression along the cut lines to define the lines and create dimension. A swivel knife is a nice little too have in your bag of leather crafting gear. It's a blade mounted on a knurled barrel with a yoke at one end that your index finger rests in. The barrel is moved with the thumb and middle finger while pressure is applied with you index finger. It allows for much more precision then a razor blade. We'll begin by tracing a design onto the leather with the stylus. I solemnly swear I'll post the pattern I made for this bracelet. Designs are fairly easy to create, and some free ones may be found on Tandy Leather Factory's website. Cut the lines you traced on the wet leather with your swivel knife, or a razor blade if you want to do it real ghetto style. Apply even, light pressure with your index finger while drawing your entire arm across the leather, using your thumb and middle finger to pivot the blade. Again, screw around on spare leather to get the feel first. keep your blade upright, you want the cut to be square with the surface, and about midway through the leather. It does not take much pressure to do so. Smooth, long stroke are much better then short choppy ones. Think of it not as cutting but painting. Once your lines are cut, time for shading and tooling. A square shader has a rounded squarish head set at an angle. Place the point of the angle on the cut line and tap the tool with your mallet. I like to hold my tool in my left and strike with my right (dominant) hand. Keep it square. Follow the line to an intersection. Review your work. You can always go over it again, so don't whack it hard the first time round. I like to clearly define my exterior edge lines. For the interior lines depending on what you wish to depict, you can lightly trace it with the stylus and deerfoot (eyes, nose). For the wings I "feathered" the line by drawing the tool away from the cut line while lightly tapping on it with the mallet. EXPERIMENT!! Scrap leather is cheap. Examine the images closely. The darker the burnishing, the more pressure applied. Once complete, head back on over to the Dyeing and FInishing step. I recomend lighter colors for carved leather, I think it shows the tool work better. Whallop some evenly spaced holes in two rows at both ends. Same number of holes. I recommend folding the leather in half and punching two holes at once. I spaced mine 1/2 inch apart, and 1/4 inch in from the edge. I really cant think of an effective method of explaining how to lace it up, so follow the images as reference. You will note only the "face side" is actually crossed. "Stitch" lacing is more then sufficient to hold it together, and crossing it complicates matters a whole lot. I recommend 3 pairs of holes, seems like a good number and more is difficult to loosen and even more difficult to lace together. Despite its complexities, lacing gives a fine looking result that doesn't come loose and is easy to due on the lowest of budgets or material constraints. And as for the inconvenience of loosening, why are you taking your awesome leather bracelet off in the first place? Stamps are like tools on steroids. You buy a single shaft and interchange with different stamp "heads". Hundreds of different patterns and figures are available. Case the leather, line it up, and hit it repeatedly. After maybe 5 hits, take a look at it. If not enough detail has been transfered, carefully align it up again, and keep on pounding. The impressions will look rather irregular, that's ok, they look much better once stained. Lets face it. Bling bling studs look cool. They are also fairly easy to add. Punch a hole in the leather. This hole needs to be big enough to let the "cap" portion of the rivet through. Poke the stone stud in, and place face down on a rubber mat. A special mat is sold for this, I recommend getting it. Place the cap on, and tap with tool and mallet. One tap is really all you need, they "pop" together nicely. They also sell bezel thing that frame the rivet. Just put it between the stone and the leather and pop the cap onto the back. I told you they where easy. Don't use decorative rivets for load bearing applications, they don't tolerate the strain well. I hope you enjoyed my first installment on leather crafting! Questions/Comments/Ratings/Votes are very welcome, I'd also love to see what you've made. i hope you're still active on this years old thread! i'm looking to start this project and am shopping for leather on tandy's website. The remnant big are literally a mixed bag of scraps. They tend to be a little thicker. I used their small sheet, it's about 5oz leather and I believe it's 8 1/2 x 11. A lot of craft stores sell those small pieces too (Michael's, Hobby Lobby). iv got to say. that is a beautiful watch with either strap. what kid of watch is it? Great instructable. This is better than most books I have on leather working. Thanks. Where did you get that watch and about how much was it? what kind of watch is this? Very Steampunk-ish. Do you know the brand? Yeah it's from Stauer. they have some decent timepieces for relatively less expensive. I really like your Leather 101 tutorial. It is very clear and well explained. My kids like the 3D stamps you used in this section, but have a difficult time hitting the stamp correctly and repeatedly. 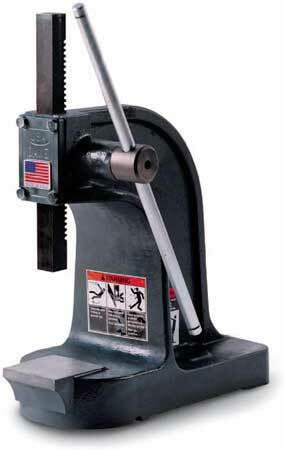 I purchased a 1 ton arbour press for about $30. You put the cased leather down, then the 3D stamp, then the arbour press head presses the 3d stamp. In this way even my 5 year old can safely and very effectively make excellent impressions with 3D and letter stamps. With the 1 ton arbour press it is easy to press down too hard with small stamps and letters on thin leather, even for a 5 year old. You need to practice not putting your whole weight on the press, though it is so tempting. Tandy Leather sells something similar for $200, but has more gadgets. Presses can indeed produce excellent, and consistent stamps, however I can honestly say I've never used one other than the Tandy version, I did not know they could be had so cheaply. If you put a leather flap over the watch it would look alot like Captain Jack's time travel/teleport device!